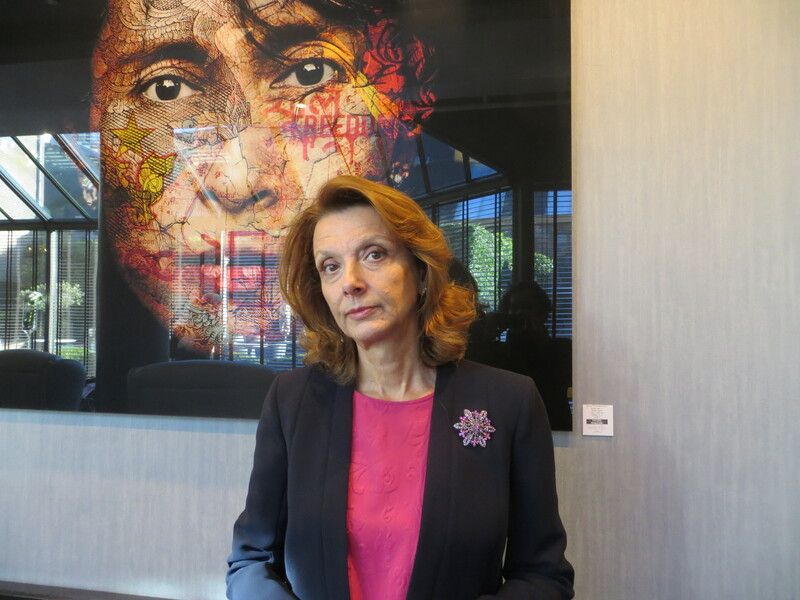 On the day NATO invited the Western Balkan country of Montenegro to join the military alliance, EURACTIV spoke to its Defence Minister, Milica Pejanovi?-?uriši?, in Brussels. Professor Milica Pejanovi?-?uriši? is the Defence Minister of Montenegro. Pejanovi?-?uriši? spoke to Matthew Tempest. My first question shouldn’t even really be a question in 2015, but you’re a defence minister, and a woman. Does that have advantages? Or disadvantages? Well, I’m not the type to make a difference between the genders – I don’t have that perspective at all. You don’t think it works in good ways, or in bad ways. No, it’s not an issue for me. France and Italy have also had female defence ministers. There is a number of them. You don’t see yourself as a feminist, or a trailblazer in your region, through your gender and your job? Not at all. Gender is not an issue. The issue is knowledge, competence and professionalism. Tell me about what happened this morning, and the stage you’re at in negotiations with NATO. Is there now a smooth course ahead to Montenegro joining NATO, or could there still be obstacles? No, it’s a clean slate for joining NATO, it’s the standard procedure. This phase of Membership Action Plan, or MAP, which lasted for years, including the intensified and focused dialogue which was in place last year after the last NATO summit held in Cardiff, were intended to prepare Montenegro in the best way when it comes to criteria and principles between the members of the NATO alliance. Once assessed positively, we were qualified for this round, which is getting the invitation, to join NATO. So, it’s an invitation for membership. It’s a kind of effectuation of the NATO ‘open door’ policy. So, we had the open door, and now we passed the threshold and we entered. By entering, we are now supposed to … to do the final tunings and the visitations. That will be a kind of technical negotiation, between us and NATO, where we have to draft together that essential protocol. After doing that, it will be treated in a way that it’s got positive ratification in all 28-member countries. And that’s it. And do you have a date in mind when you can say ‘Montenegro is now a member of NATO’? It could be between a year, and a year and a half. Probably. But on the other hand, I don’t like to talk about the dates, because what matters are the processes, and the result we get in the process. And then once you are effective, the date always comes in time. Do you foresee any objections? No. I feel it will be an easier phase than the previous ones. It’s all about NATO and ourselves. So if in this phase 28 member countries put forward their position – and in NATO, it is always full consensus, and full agreement that Montenegro is ready – I expect that this kind of positive cooperation we are having between ourselves will continue. You must have seen the comments of Sergei Lavrov [Russia’s foreign minister], who said it would be a ‘provocation’ for you to join NATO. I think another Russian MP said it might make you a target of Russian missiles. Does that worry you? No. They didn’t say ‘missiles’. Where did you find that? There was a number of messages from Russia on that issue, but it’s a standard way. Russia is reacting to what is a NATO enlargement policy. That is something that the other countries experienced, which have become NATO members after the fall of the Berlin Wall. There were protests in Podgorica, against you joining NATO. Do you think Moscow had any hand in those? The protests originally weren’t about NATO. They were normal protests of (the) opposition, who were concerned with certain issues of our electoral environment. Fom that point, we started procedures to build the confidence of all political actors in Montenegro for further improving all the legislation in this field. At one point, of course, there were some interpretations that this might be also related with NATO. And of course, if understood like that, then it’s nothing new, since in Montenegro, for years now, we are having very intensive campaigning, pro-NATO campaigning, and on the other side also parts of society which are anti-NATO. Montenegro is a democratic country, where everything has to be done in a normal democratic way. I don’t see that it is of any concern for anyone. We will be handling these issues, as in every democratic country. There is no threat like that. What can Montenegro bring to NATO? It’s a very small country, obviously. 28 member states deciding to invite Montenegro understood what Montenegro can bring to NATO. And Montenegro can bring a lot of things, in complete disproportion with its size. Montenegro is already a country which has hugely contributed to the security and stability of the region, and beyond. On the other side, as well, we are contributing to global peace and security through our participation in a number of different missions, including peacekeeping missions. On the other side, developing our capabilities might be useful for the global alliance. Does Montenegro see NATO membership as a natural stepping stone towards joining the EU? Definitely. We do see those processes as complimentary ones – and that’s not only our perception, it’s really like that, because we are deeply into negotations in the EU process. And if you see closely what is the latest progress report from the European Commission, then you will see there are a number of issues which are overlapping when it comes to rule-of-law, the fight against organised crime, government corruption, freedom of media, freedom of speech. All these political criteria are important from a democratic point of view, and are also considered deeply, and in detail, by the European Commission. The same thing is very relevant for adopting the principles of the North Atlantic Organisation. This complementariness is something that is very important. “28 member states deciding to invite Montenegro understood what Montenegro can bring to NATO” Another parasite feeding on the American people.